Indeed, Iron Man’s concern, fleeting though it might be, reflects larger debates floating in the ether of public discourse. One might argue, however, when Americans do worry about drone strikes, morality plays a smaller role than tyranny. Granted, some do question the morality of state-approved drone strikes that render real collateral and lethal damage to innocent civilians in Pakistan and Afghanistan, but more often Americans worry about the federal government deploying drones against them. When the inkling of a rumor of a whisper about drone use in last year’s Christopher Dorner manhunt arose, news outlets ran with it, noting it was the first time drones had been deployed in “hunting” a U.S. citizen. It wasn’t; in 2011 a North Dakota sheriff used them to hunt cow thieves. Even the initial debate regarding drone strikes in Pakistan focused more on the security leaks more than the damage they were doing on the ground. Enter Star Trek: Into Darkness, not only the second of the new reboot, but also apparently, an Alice in Wonderland version of the original Star Trek II replete with anguished cries of “Khan! !” from usually unemotive Vulcan Spock. An act of “domestic terrorism” (though the term seems inaccurate in the context of Star Trek since it basically means any act of terrorism on Earth; interestingly, the nation-state seems an afterthought) drives the plot in Into Darkness’s early stages. 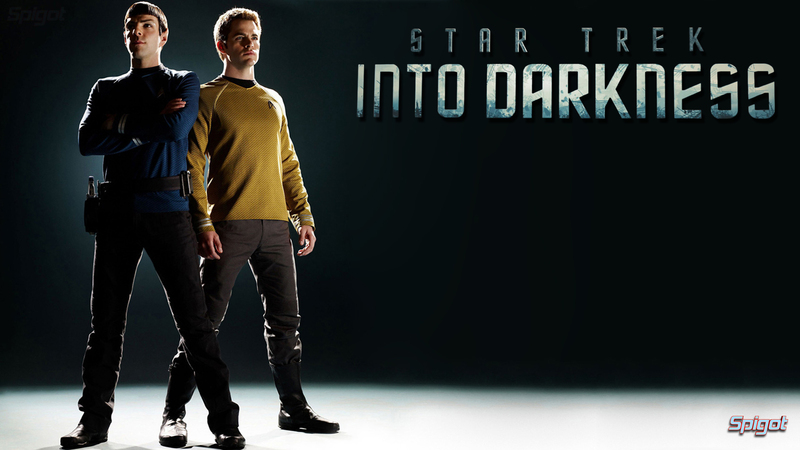 When officials identify the culprit, John T. Harrison (played by the new Sherlock Holmes, Benjamin Cumberbatch) and convene to remedy the situation, the former federation-member-turned-rogue strikes again, killing Admiral Christopher Pike among others which unleashes a can of father-son themed angst as Chris Pine’s James T. Kirk recoils from his mentor’s assassination. Armed with the an experimental new super weapon and given orders that clearly violate the Federation’s own regulations, Kirk, Spock (Zachary Quinto) and the rest of the Enterprise crew assemble on a mission to the largely uninhabited world of Kronos. On the edge of Klingon territory, Kronos has apparently become the equivalent of a failed state providing shelter for a terrorist that only the future could portend. Though ordered to render their target lifeless without due process, Kirk, acting on Spock’s advice/hectoring, opts to first try and apprehend Harrison. Though Kirk, Spock, and Uhura capture him—or more accurately, he lets them capture him as part of a larger, more complex agenda – the message appears to stand in opposition to the kind of policies the Obama administration has carried out in recent years. The whole incident, it turns out, in part disrupted by Kirk’s decision to apprehend Hamilton and his, Spock’s and Uhura’s (Zoe Saldana) collective inability to kill or injure their freakishly strong prey, disrupted what had been set up as pretext for an internal conspiracy meant to establish a militarized Federation. The new armed Federation, headed by Admiral Marcus (Robocop’s Peter Weller) would bring hostile species like the Klingons to bow. Clearly, Afghanistan, Iraq, and the continual throbbing of America’s terrorist threat lay at the heart of Into Darkness. Much like Iron Man 3, Into Darkness traffics heavily in the kind of iconography that Dargis noted. When rogue Federation officer Harrison barrels his ship into the skyline of a futuristic San Francisco, it’s hard not to have flashbacks to the ubiquitous images of planes flying into the World Trade Center. Bodies upended hundreds of feet into the air function as eerie reminders of WTC jumpers. Unlike Iron Man 3, which Dargis pointed out blew up massive amounts of Los Angeles but did so without any apparent bloodshed, Star Trek allows for out of focus bodies to go perilously flying across the screen towards what one can only assume is an ignoble and tragic end. When Kirk delivers a speech at the film’s conclusion reminding his fellow Federation officials that they “should all be wary of the thirst for revenge and awakening evil within themselves,” noted Kevin Gosztola, Into Darkness functions as heavily cream frosted allegory with a heart of seriousness. While both Iron Man 3 and Into Darkness employ humor fairly successfully, each exists primarily as an action film with a veneer of political seriousness. In their own way, action films can best bridge the gap between serious engagement and magnificent explosions with pithy but humorous little quips tucked into their folds. By placing their films into a definite political context at their outset, each can then comfort your worries by overloading you with CGI cotton candy. Real terrorism, drone strikes, and mass carnage can only afford so many laughs and playful hijinks. As noted by Orci, earlier films have performed similar cinematic feats, but in the context of US-USSR international tensions. During the Cold War, similar themes surfaced but the enemy remained an identifiable nation state and its tools of devastation confined to “mutually assured destruction.” For the US, the USSR a clear, knowable, adversary, seemed more open to satire. Spies Like Us, Stripes, and others laughingly mocked Cold War hostilities. 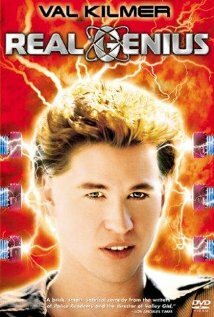 However, few align better with Iron Man 3 and Into Darkness than 1985’s Martha Coolidge classic Real Genius. Under the thumb of Hathaway, Mitch and Knight scramble to complete their research project, a super powerful laser. Only when Lazlo Hollyfeld (John Gries), a former Pac Tech prodigy himself who suffered a meltdown when he discovered his own scientific discoveries were being weaponized a decade earlier, warns the duo that the fruits of their labor might be poisoned. Living out of the basement, the entrance to which can be reached through a hidden door in Mitch’s closet, Lazlo appraises Mitch and Knight of the laser’s dubious application and they begin to concoct a plan to undermine the weapon’s test performance. The movie’s opening sequence takes place in a darkened room where a handful of government elites watch a film depicting their new weapon’s capability, letting the audience know from the outset the endgame at the center of the story. When one member suggests the weapon offered little use in traditional warfare, government liason David Decker concurs: “It’s not intended for use in your kind of warfare … It’s the perfect peacetime weapon. That’s why it’s secret.” Another attendee inquires, “So it’s both immoral and unethical?” Thereby eliciting evil white man 1980s laughter that clues the audience in on the whole scam. A ridiculous conclusion follows, involving massive amounts of popcorn and lasers while the credits role to the soundtrack of Tears for Fears’ “Everybody Wants to Rule the World,” a fitting musical accompaniment. By the end, Knight and Taylor alleviate themselves of any residual guilt while dooming Hathaway to a lifetime of PBS channel NOVA type science productions. If you want to play a game of Kevin Bacon-like degrees of separation, Val Kilmer provides the thread. 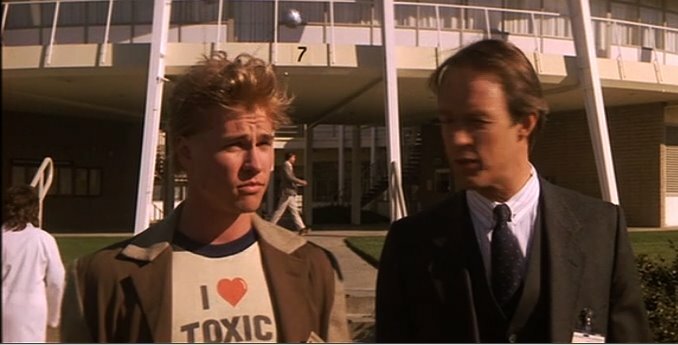 Kilmer stars in Real Genius and later Kiss Kiss Bang Bang (2005). Shane Black directed and wrote the 2005 neo-noir staring Robert Downey Jr. and the aforementioned Kilmer. Black and Downey then teamed up again for the latest in the Iron Man series. Kilmer’s turn as Ice Man in Top Gun, a picture devoted to Cold War tropes that somehow never mentions the USSR or communism, completes Kilmer’s turn as semi-witting to full participant in the imaginary Hollywood military industrial machine. Mitch and Knight seemed more than a little concerned that their research might be used in a militarized way — they never specify who it would be used against, just that they didn’t get into science to build weapons. Contrast this with Iron Man or even Star Trek, where weaponization of intelligence has become a foregone conclusion. While movies like the excellent In the Loop have satirized the cynical maneuvering that contributed to the outbreak of war in Iraq, no one has dared turn the subject of terrorism into a full blown comedy like Real Genius. Does this stem from the type of threat faced? The USSR, for all its bellicose rhetoric and imperial reach, always seemed more or less rational and clearly defined. While the ravages of the Cold War on Africa, Asia, and Latin America remain no laughing matter, citizens of Europe and the two Superpowers found ways to laugh in the face of imminent destruction. 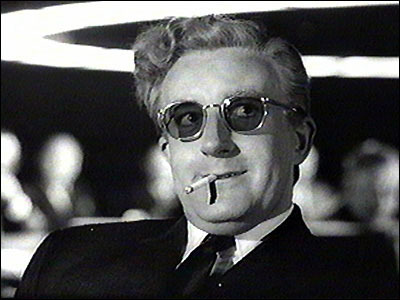 Kubrick’s Dr. Strangelove, no doubt an influence on the sheer ridiculousness of Real Genius, serves as one of the earliest examples. How much do these films even reflect national consensus? If one had taken a poll in 1985, would Knight and Taylor have been heroes for thwarting America’s development of what ostensibly represents a more primitive drone that officials might have told the public guaranteed American safety from the Soviet threat? Doubtful; Falcon and the Snowman dealt with this issue in some capacity, though it focused on more mundane government secrets than militarized scientific research, and the outcome for its protagonists was grim. Unlikely that two scientists undermining research meant to reduce terrorism, regardless of its dubious moral parameters, would be seen as comic heroes today. Shane Black’s no stranger to invoking past military conflict to drive plot. In the original Lethal Weapon, the bad guys essentially consist of Vietnam veterans who harnessed the heroin trade in their favor following the war. In Real Genius Lazlo too, one assumes, recoiled from his unwitting contributions to Vietnam. Yet, these examples both came well over a decade after America’s doomed incursion into Southeast Asia. Vietnam had a beginning and an end point; the War on Terror seems like a neverending story, one initially fueled in part by the Cold War outreach of US and Soviet leaders. The USSR’s 1979 Afghanistan adventure, often referred to as the Soviet Union’s Vietnam, set the stage for US aid to what would become, regrettably, Al Qaeda. We laughed at Tropic Thunder, but when it came out it had been nearly forty years since we announced our withdrawal from Vietnam. The 1980s may have witnessed movies like Full Metal Jacket, the darkest of comedic war films should such a category exist, but they remained tinged with sadness and loss. One day we might have an insightful comedy that removes the veil over the tragedy of drone policy while spotlighting the foolishness of elected officials and others, but not yet. 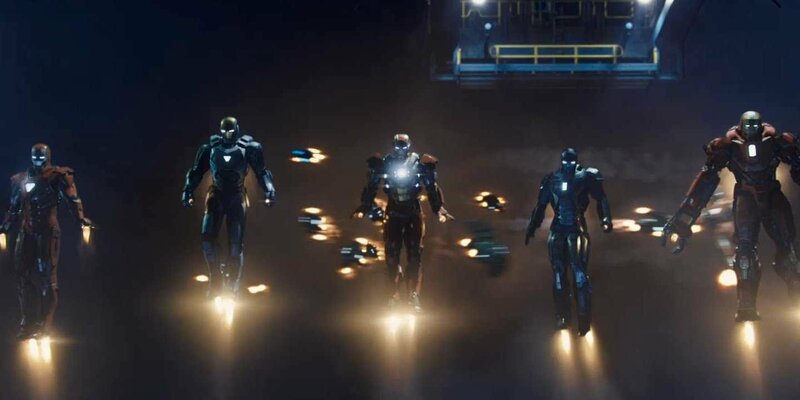 In the final battle scene of Iron Man 3, Starks, Don Cheadle’s Colonel James Rhodes and a small army of computer operated iron men clash with the henchmen deployed by Guy Pearce’s evil genius Aldrich Killian. In its earlier moments, the movie takes time to show us how Pearce’s invention, problematic as it was, helped to heal damaged military veterans, thereby asking real questions about our obligations to wounded servicemen and women. Yet, in this final scene Black treats them like veritable detritus from the war, functioning as basic stock villains combusting in a display of human fireworks. Unlike Mitch Taylor and Chris Knight, Killian and his colleague Maya Hansen stray from their initially pure impulses; one could make a similar claim regarding Tony Stark. Even if superficial, Iron Man 3 and Star Trek Into Darkness certainly entertain. After all, one should temper expectations for these things, but Christopher Nolan (the Dark Knight Trilogy), Joss Whedan (Avengers), and, yes, JJ Abrams himself (Super 8 and the initial Star Trek reboot) have shown us these types of movies can be better. As for Real Genius, it’s just funnier laughing at something that seems quaint in retrospect: the waning days of the Cold War were hysterical! Fifty years from now when the Klingons have us under their heel, we can look back at the War on Terror, laugh and wonder what all the fuss was about.